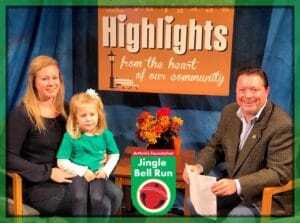 The show airing November 19, 2018 – December 3, 2018 ‘highlights’ the Arthritis Foundation of WV and their upcoming Jingle Bell Run scheduled for December 1, 2018, at the Columbia Pipeline Auditorium beginning at 8:00 a.m.
We interviewed Crystal Ballengee and her 4-year old daughter Maggie, who is the Youth Honoree for the Annual Jingle Bell Run to benefit the Arthritis Foundation of WV. Crystal describes the situation of when Maggie was first diagnosed with arthritis after swelling in her knee would not subside. The Arthritis Foundation’s mission is to boldly pursue a cure for America’s #1 cause of disability while championing the fight against arthritis with life-changing resources, science, advocacy and community connections. Nationwide for 70 years, in ONE community after another, the Arthritis Foundation has taken colossal steps to conquer this crippling disease. The Arthritis Foundation leads the fight for the arthritis community. They help millions of people with arthritis conquer everyday battles through life-changing information and resources, access to optimal care, advancements in science and community connections. Their goal is to chart a winning course, guiding families in developing personalized plans for living a full life – and making each day another stride towards a cure. Please join Crystal, Maggie, and hundreds of others as they raise monies while having a great time. We also interviewed Laci Canter and Allyssa Covert about their upcoming University of Charleston Holiday Concert scheduled for December 2, 2018 at 4:00 p.m. in the Erma Byrd Gallery in Riggleman Hall at UC.